Enterasys Networks wins our Network Innovation Award for its remote network management suite that lets engineers manage networks using Facebook, Twitter and Salesforce.com. 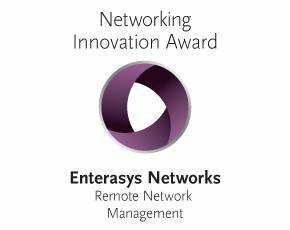 Editor's note: Enterasys Networks is the winner of SearchNetworking.com's May Network Innovation Award for its remote network management strategy. With Project isaac, part of the company's Network Management Suite, network pros can receive network health alerts and send troubleshooting commands in simple language, using Facebook, Twitter and Salesforce.com Chatter. Enterasys Networks has a new vision for remote network management. With the company's isaac technology, users can receive network health alerts and send commands to network components through Facebook, Twitter or Salesforce.com's Chatter using simple language in a tweet or chat. With isaac, which is part of the Enterasys Network Management Suite (NMS), network managers can set thousands of network alert signals and then create lists of network management commands that are mapped to plain English (or the regional language of choice). Once these commands are mapped to simple language, commands can be sent to network components that are basically "friended" through social networking tools and each given their own identity. Isaac works across a multivendor network, and it is now integrated with Enterasys' new bring your own device (BYOD) management tool, Mobile IAM. That means network engineers can have visibility into every mobile device connected to the network and manage those connections by a simple tweet or chat conversation. Enterasys Chief Customer Officer Vala Afshar is the first to admit isaac is a technology that lives only among early adopters for now. But isaac's potential to change how and where networking pros manage their infrastructure won Enterasys this month's Network Innovation Award for network management. In this Q&A,Afshar expounds on isaac. Why bother with social networking tools for remote network management? Vala Afshar:At Enterasys, one of our strong verticals is education; we have 600 active universities across the globe. Both students and faculty are very active [with] social collaboration [tools]. Recent studies show that 40% of college students check their mobile devices every 10 minutes. One out of every five minutes on the Web is a social interface. From a user perspective, you want to be connected no matter where you are, and you want to collaborate using an interface that you're comfortable with. When we thought about these megatrends from a user and CIO perspective, for us it was one-plus-one-equals-three. Why can't we extend that mobile and social user experience, whereby they can use their smartphones and tablets while they're using a Twitter or Facebook or Salesforce.com Chatter interface to have visibility and control of their enterprise network infrastructure? What does it take to implement isaac with the network management suite? Afshar: It's a functionality that is already embedded as part of network management suite. With early adopters, they contact our technical support center, and our staff walks the customer through to map traditional SNMP and syslogging -- complex machine language -- to a social command that the customer is familiar with. [The process] is all very well documented. When I say [we walk early adopters through], it's because this is a new solution, and you want to be able to speak to all the security measures that have gone into designing isaac. When you use private social networks like Salesforce.com, you have certified compliance. We have enabled two-factor authentication, so that if you want to issue a command to control devices, you would configure isaac so that a five-digit random PIN is delivered via email or SMS ... and you have to enter that PIN to control the machines. When we talk to that early adopter, it's to show them all the robust triggers and capabilities that they can configure. Is there a limit on the natural language or types of commands that one can use? Afshar: The customer can pick any kind of command they are comfortable with. If I wanted to locate a user on my network, the command could be find Vala or locate Vala or pinpoint Vala -- whatever commands you think are consistent to the nomenclature that your staff would be comfortable with. You use that one-time mapping of the natural language, and after that your cheat sheet of commands is no longer machine language. You have said that isaac enables a more automated back-end network management support system; how is that? Afshar: At Seton Hill University, CIO Phil Komarny started using Twitter as a way to manage his network using isaac. At Enterasys, we use Salesforce.com for our global services support organization. What that means is that when customers contact our back-end system to manage the customer relationship, it is in a Salesforce.com services cloud. Salesforce also has an enterprise collaboration capability called Chatter. This year, we asked Phil to not just use Twitter, but we invited him to use Salesforce.com [using a] private Chatter group. We had already enabled all the network diagnostic alerts and reporting functionality at Seton Hill, so when Phil and the Seton Hill team registered their NMS onto our Chatter cloud, we could begin to take these [health alert] chats and automatically parse the forensics being sent to us to create helpdesk tickets. So if you have a device that's offline and we receive that chat, it automatically creates a ticket and informs Phil and his staff -- it's an automatic workflow. We've created a case, the correction is on its way, and that entire front-end lifecycle is now machine-to-machine collaboration via a social network with automated service delivery. For someone managing a services organization, that is pure nirvana. Enterasys has new mobility management technology; does it intersect with isaac? Afshar: We recently launched our Mobile IAM solution, which gives us visibility into what devices are on the network and the location of the users and the type of apps [being accessed]. This gives us granular visibility and control, and it is the only solution available that has a social media interface. Any syslogging or SNMP tracks that are produced as a part of Mobile IAM can be mapped to an isaac message, and that message can be delivered via Twitter, Facebook or Salesforce.com Chatter. How much consumer demand is there for social networking-based remote network management? Afshar: We have about a dozen users. Because of the disruptive innovation and newness of isaac, it's not something we anticipate is going to reach a tipping point any time soon. Universities are our focus now, because higher education CIOs are pushing the envelope in terms of technology. Having said that, we have a hotel that is managing its wireless and wired infrastructure using Facebook [with isaac]. When you think of [potential] verticals, any large [distributed] campus environment could use this technology.